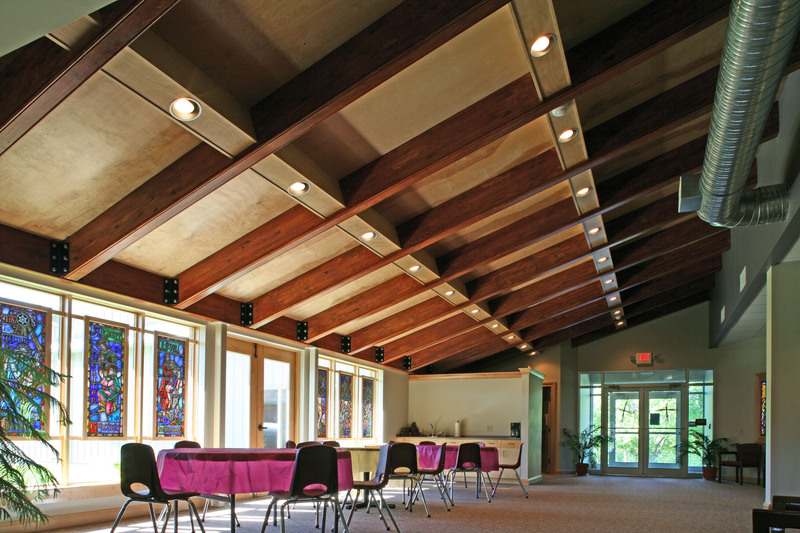 A pre-engineered building was the logical solution to provide a large multi-purpose room and classroom addition for this church. It allowed us to reduce the cost of the addition, design it to connect to the existing building, and use stock factory details to blend the exteriors. The lower costs and simplicity of the pre-engineered building allowed more money to be used for interior amenities and aesthetics, providing more satisfaction within the congregation by giving them all the space and functionality they wanted in the new addition. This architectural rendering of the proposed addition was provided to the building committee and the congregation prior to starting the project. It allowed everyone to visualize the expansion and instilled a high level of enthusiasm that made it easier for the project to move forward. The view from the parking area shows both aspects of the new addition. On the left is the narthex addition with the new main entrance. Here we used a conventional stucco exterior. 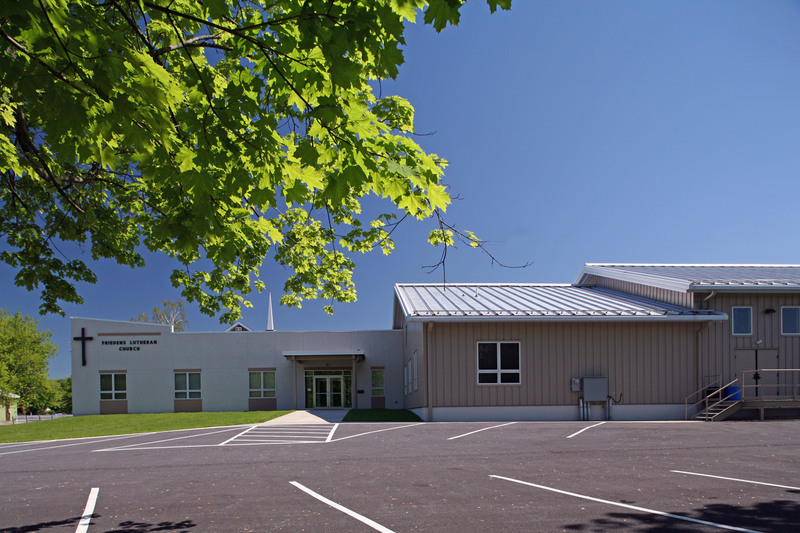 For the adjacent multi-purpose gymnasium on the right we used a conventional steel building frame and siding. Color themes and window styles provide a harmonious exterior aesthetic to the two different sections. Stained glass window panels were removed from the sanctuary during the expansion and used in the new narthex where they bring a traditional church element into this popular gathering place. A choice of seating options, a coffee bar, and plenty of open space in the new narthex make it comfortable and easy for the congregation to socialize before and after services and events. The exposed wood-beam lean-to ceiling adds a dynamic architectural feature that enhances the charm of the space while providing a practical structural purpose. 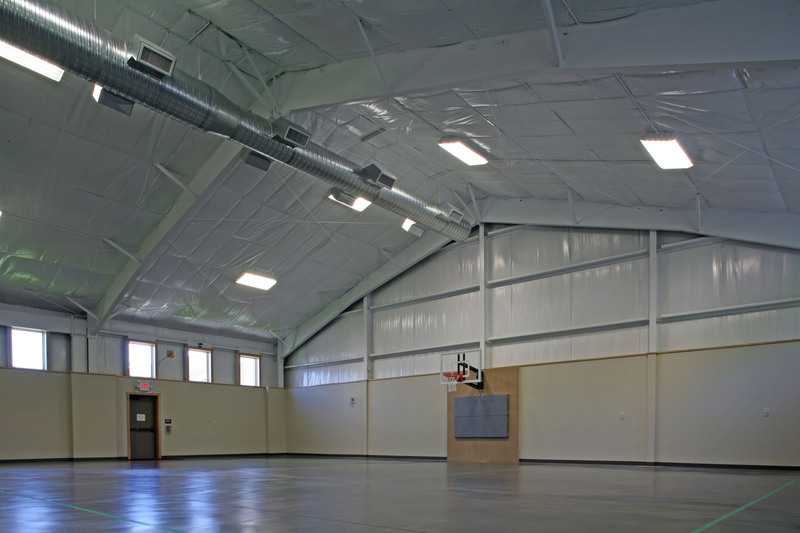 The new large multi-purpose room gets a lot of use for church functions, community groups, sporting events of local organizations, and the churches’ childcare facility that uses it for indoor recreation. Adjacent to the gymnasium is a commercial kitchen, food pantry, large storage areas, and new larger restrooms. An exterior loading platform makes it easy to receive deliveries of all sizes. A connecting door to the narthex can be locked off to increase security during non-worship service events.